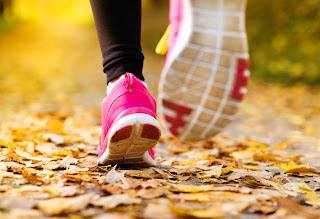 Luckily in fall, exercising doesn’t have to be a bother. The cold, crisp air combined with the beautiful color-changing leaves makes exercising outside a treat this season. Getting in a new routine, however, may mean that you might feel a bit overwhelmed. If you’re feeling unmotivated at the thought of a long stint at the gym, you don’t have to worry - research has shown that several short bursts of exercise during the day can have the same health benefit as one long session. Exercise and physical activity is especially important during the cooler months, and stretching becomes ever more important because it increases and maintains flexibility. Here are some fun, autumn-themed exercise ideas that you can do either in longer sessions or just as a quick pick-me-up during the middle of the day. A short and easy walk outside will surely boost your energy for the rest of the day. Did you know that a walk or any other “low intensity” work out forces the body to burn more body fat? Walking certainly gets the nod for pure fat loss! Find some nice walking paths near your office or in your area, and bring a colleague during lunch time. You’ll feel refreshed and rejuvenated after a brisk walk through the colorful fall leaves. Kayaking is a perfect fall sport, especially if you live in an area covered in the gorgeous oranges, reds, and yellows of autumn. If you leave near a river or lake, consider taking a day trip to try your hand at kayaking. Being immersed in nature while getting a bit of exercise is the perfect way to relax and burn some calories at the same time. And the great thing about kayaking is that you can always set your own pace, so take a break when needed and enjoying your lush surroundings. Get your move on at home while also getting your house in order! Raking up all the leaves in your yard is a full body exercise that works many different muscles and joints through a complete range of motions. Fall gardening is also a treat, so try your hand at fall root vegetables like pumpkin, squash, and carrots. Take your dog for a walk around the block, and if snow arrives early, shovel away its first layers in your driveway. The satisfaction you get from a job well done has a host of mental and physical benefits for you. Sustained and regular physical activities like housework reduce the risk of heart disease, offering great cardiovascular and metabolic benefits. The cooler Autumn months are the perfect time for some mountain biking! The idea is always to ride, not to race, so you can set your own pace. Check out adventure races in your area, which mix riding with the need for some navigation skills. Mountain biking is something that can be enjoyed by the entire family, including kids and seniors. Apart from the beauty of getting out into nature on wooded trails, mountain biking is an excellent source of exercise and a great way to maintain a healthy body weight that can lessen those age-related changes to the body. You’ll be giving your leg muscles a go while other muscle groups will also get quite a workout during your ride, especially over rugged terrain. Adequate nutrition before and after your outdoor activities can help your body perform at its best. Good nutrition also helps your body recover again after a bout of exercise, and this is important to avoid injuries. Enough protein, carbohydrates, fat, water, vitamins, calcium and other micronutrients should be included in your diet, certainly according to the demands of the exercise you participate in. If you’re trying to lose an extra ten pounds before the holiday season begins, try some fat burner supplements that will help you up your weight loss game. There are also plenty of excellent nutritional products will match your exercise needs and contain nutrients in amounts similar to that found in our food and which meet your Recommended Dietary Allowance (RDA). These products are great options to try and are supported by scientific studies to meet your nutritional- and fat-loss needs and to enhance performance. We understand the temptation to stay inside and cuddle up when the weather gets cooler. But getting out and about in autumn will make you look great and will give you the routine, confidence, and running start to prepare for next year’s summer beach body. Author's bio: Samantha is a health, food, and travel writer living in Berlin, Germany.